Mary is a retired high school English teacher who creates beautiful beaded jewelry using semiprecious stones, metal, and crystals. 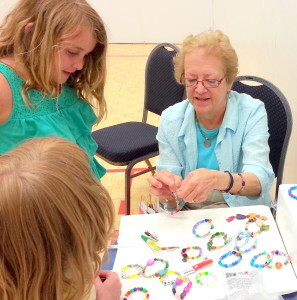 Mary also hosts jewelry making art parties for children and adults. You can see more examples of Mary’s work at the Artists at Heart ArtFire Seller Shop, or on our Flickr site. Mary’s father started a flower shop in Allentown in the 1930’s. He started with a cart and some cactus and grew the business to be one of the premier flower shops in the Lehigh Valley – Phoebe Floral. Growing up, Mary spent a great deal of time in the flower shop, and in addition to inheriting the entrepreneurial urge, she has always enjoyed a variety of creative endeavors, not the least of which is cooking. After retiring from teaching, Mary took some beading classes and started a successful small lunch catering business for her teaching colleagues. When she had trouble finding a suitable commercial kitchen, she stopped bagging lunches and started beading in earnest. Mary loves gemstones. She is always on the lookout for new and unusual gemstones and loves to make fun, specialty earrings and bracelets. She has lines of sorority jewelry, pets and animals, foods (garlic earrings for garlic festivals, blueberry jewelry for blueberry festivals, etc.). She also makes awareness jewelry and fun holiday jewelry. She has flag earrings, turkey earrings and many others and loves to find new things for people. You can view her beautiful collection at one of our many local events,, or schedule your own personal home showing.